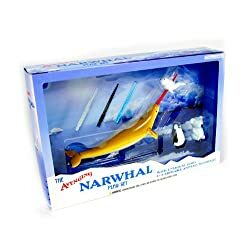 AVENGING NARWHAL PLAYSET Some question the value and realism behind this toy. I feel that they do not completely comprehend the history of the AVENGING NARWHAL, and his profound significance. The AVENGING NARWHAL does not kill in vain. He is motivated by the slaughter of his family, in a heartless bloodbath, by the Penguin Cabal--supported by the all too guilty Baby Seal League. Driven by this tragedy, the AVENGING NARWHAL is compelled to pursue all the vicious enemies that might have led to the destruction of his pod. This, no doubt, includes Koalas Inc., a treacherous and ambitious corporation that moved their ill deeds to the seas when the boon of eucalyptus could no longer satisfy their greedy little fingers. Their CEO, Koala Bear, is a feature of this dynamic, chilling, and important play set.